These bags are 7 1/8" x 10.5" with a 1.5" flap. 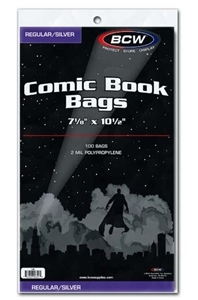 Made of 2 mil thick crystal-clear polypropylene, they are designed to fit silver-age comics and are intended for use with BCW's silver boards. These are the bags that we use for our over-sized and prestige-format subscription books.